This book was so much fun! I really liked Pixie Jones and all the details about party planning. A great story about learning to be yourself and being forced into the spotlight when you think you want to be invisible. "I am the opposite of a mermaid and that’s exactly the way I like it." Shy and quiet, Pixie does everything she can to fade into the background. All she wants is to survive middle school without being noticed. Meanwhile, her parents own the best party-planning business in town. They thrive on attention, love being experts in fun, and throw themselves into party personas, dressing as pirates, princes, mermaids, and more. When her mom leaves town indefinitely and her new friend Sophie decides to run for class president, Pixie finds herself way too close to the spotlight. How far is she willing to go to help the people she loves? 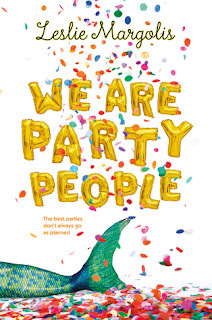 We Are Party People by Leslie Margolis was published by Farrar Straus Giroux Books for Young Readers in 2017. Pixie doesn’t like to be in the spotlight, but with her mom away she has to take on a bigger role in her family’s party planning business. It’s always intriguing to read about a character who feels forced to do things they might not want to do. There are lots of amusing moments in this story as Pixie struggles with fitting in at school and with her friends, while trying to keep her role in the party business under wraps. The details about party planning are so much fun! My mom says it's good to be observant and sensitive. She says I don't miss a thing. But sometimes I wish I would miss certain things. It's not so fun noticing everything. Not in middle school. Not when some of the stuff I witness is simply horrible and soul crushing. “We need you to be mermaid next Saturday,” my dad says, all matter-of-fact, like this is no big deal, as if he’s simply asking me to make my bed, which I’m not going to do, either. You might be interested in the way the author handled social media and technology. She doesn't shy away from it (Instagram is mentioned and so is texting) and included it as part of everyday normal life. I also really admired how the main character’s thoughts and feelings are integrated in the story. Interiority! (If that word leaves you feeling overwhelmed, check out editor Mary Kole for more). We are so different, too. What if my mom decides, one day, that she doesn’t need me as a daughter, that I’m too different? Maybe she’ll up and leave again. As a child, I was always hungry for books that dealt with the ups and downs of friendship, the pressures of peer groups and finding the place where you can truly be yourself. There’s even a crush in this book. This is a great one to have in the classroom or school library for general reading. Sounds like a great story that I could have so related to as a middle graders. Loved the first line. I can see how it would really draw you into the story. I like the interiority aspect you mentioned. After the middle graders read this one, writers can use it for growth in their own writing. Thanks for sharing. I'm embarrassed that I had not heard the word "interiority." But, I enjoyed the author's description and it makes so much sense. Adds so much depth to a character. I like your review of this story -- I certainly could relate as will many readers. Nice choice!